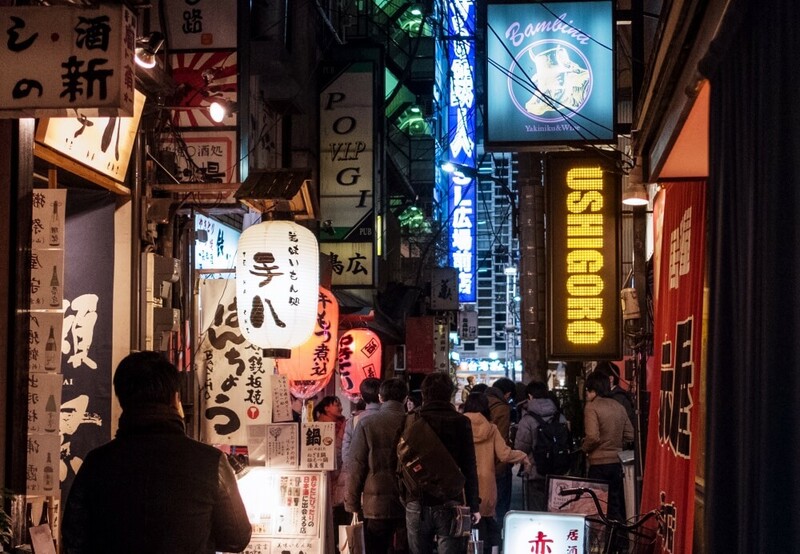 Explore the streets of Shimbashi on our 3 hour food tour. 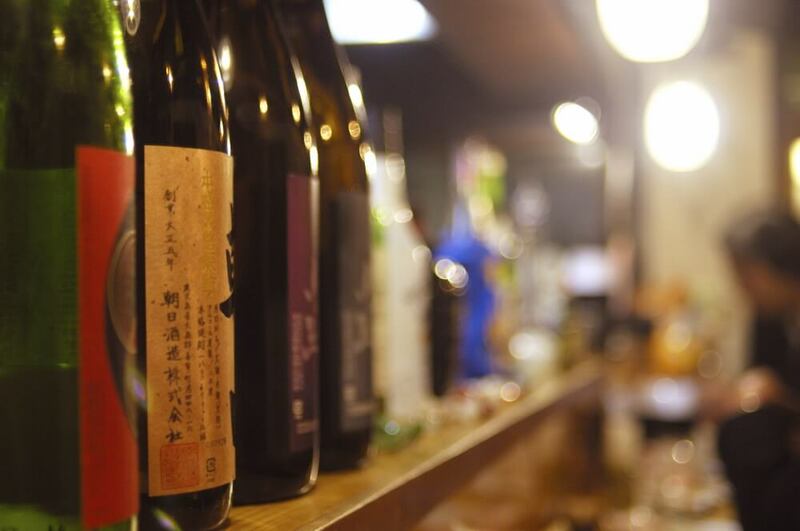 Explore the streets of Shinbashi and experience how the Japanese working class unwind after a long day at the office in a maze of eateries, izakayas and standing bars. 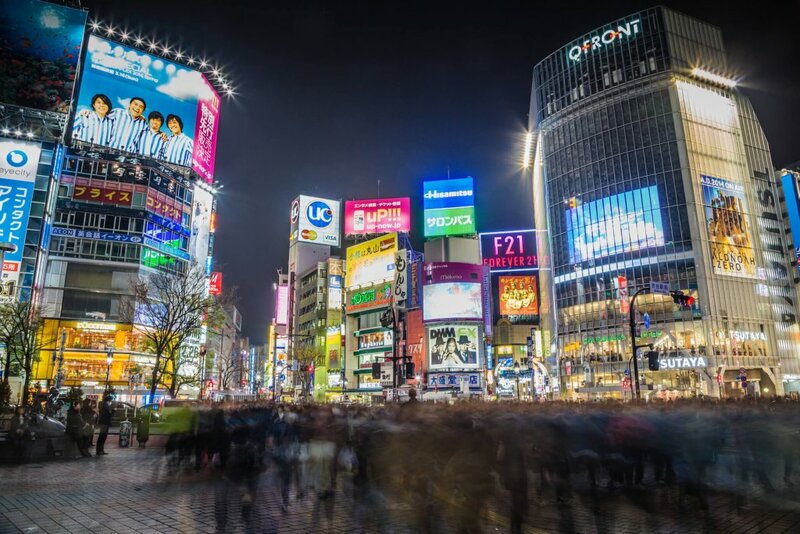 A highly recommended MUST do activity in Tokyo! 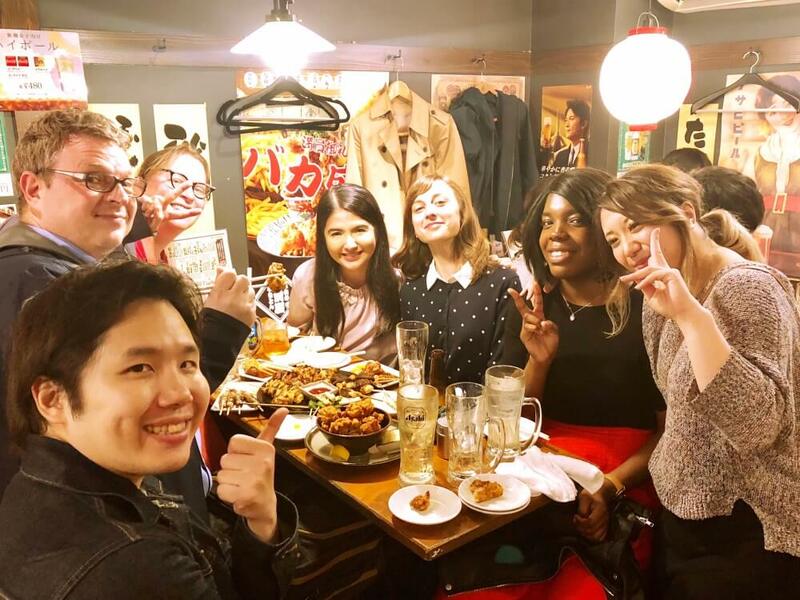 Go to local spots, this is a perfect tour for people wanting to avoid the “touristy” areas of Tokyo! Try more than 15 different kinds of dishes for an unforgettable culinary experience. 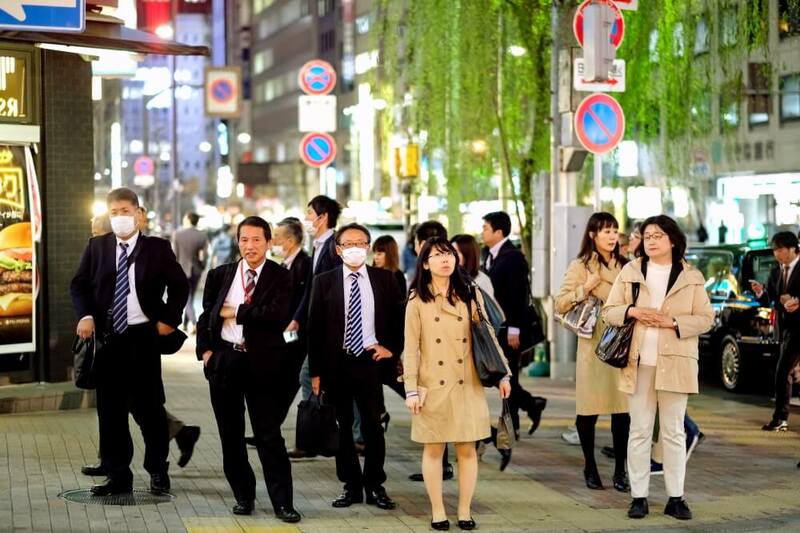 In this three hour tour we show our guests the endless rows and alleys, twists and turns of Shinbashi, the “salaryman centre” (office workers) of the world. 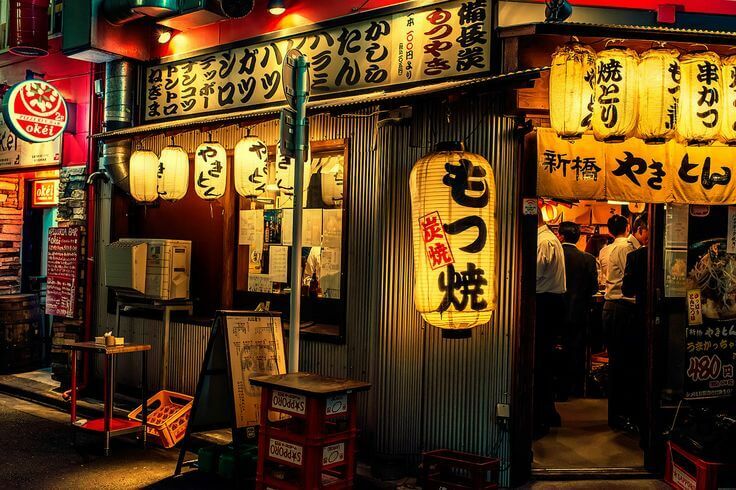 Known for its rustic izakayas and abundant food stalls, we help cut through the noise to show our guests some of the most tucked away places to grab some of the most satisfying food on the planet. Starting outside Shinbashi Station, we begin our tour by entering the chasm of eateries overrun on a nightly basis by the working class of Japan. 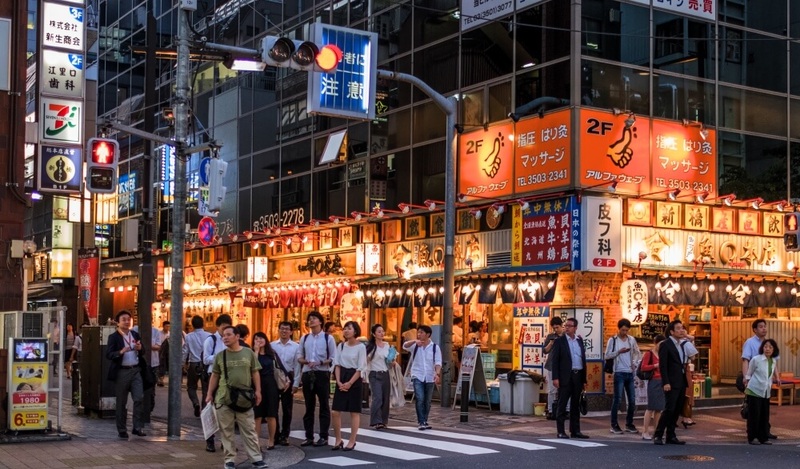 You are instantly surrounded by thousands of salarymen and office ladies descending upon their favorite izakaya bar to grab a quick bite and cold beer before taking the long train ride home. 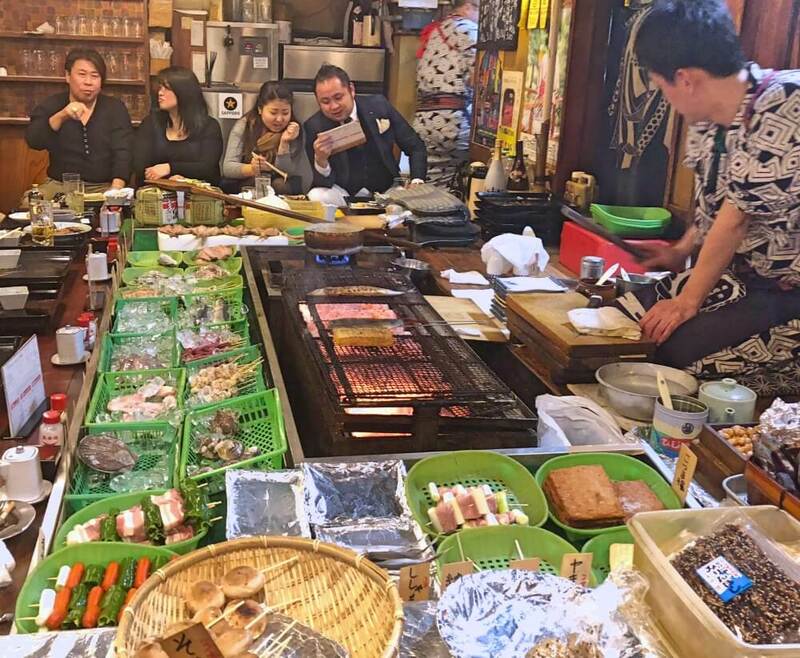 Not far into our journey we stop for local bites and an introduction to drinking and dining culture in Tokyo. 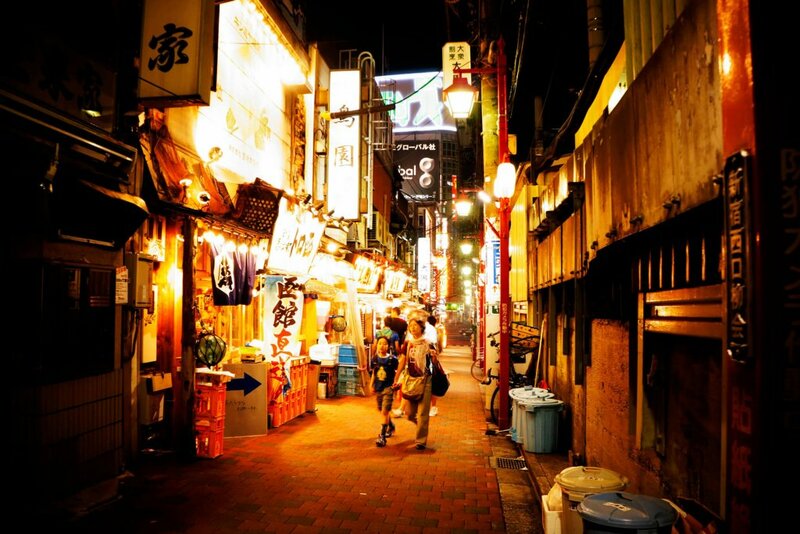 Once we are finished with our grilled treats- we continue to wind our way through the maze of local eateries, we will head to another spot that specializes in Oden. 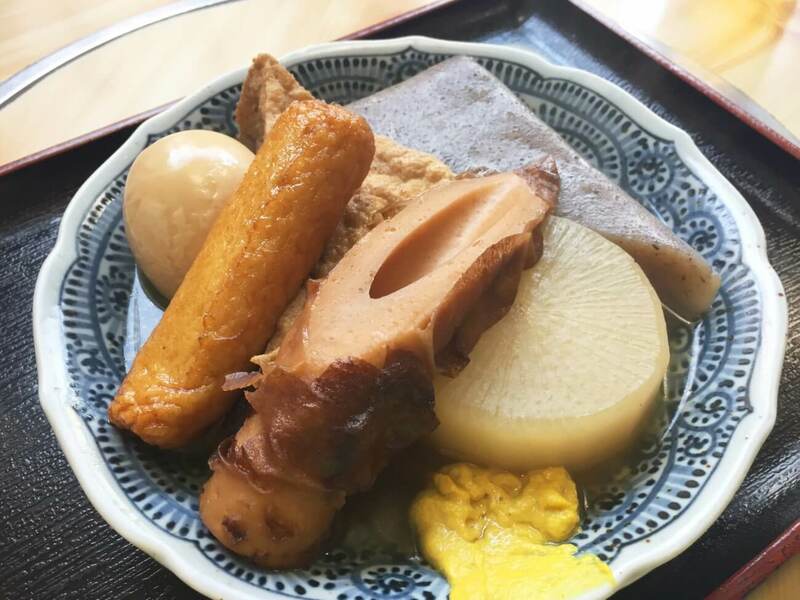 This Japanese soul food consists of a variety of ingredients such as boiled eggs, daikon, vegetables and fish cakes stewed in a light, soy-flavored dashi broth. 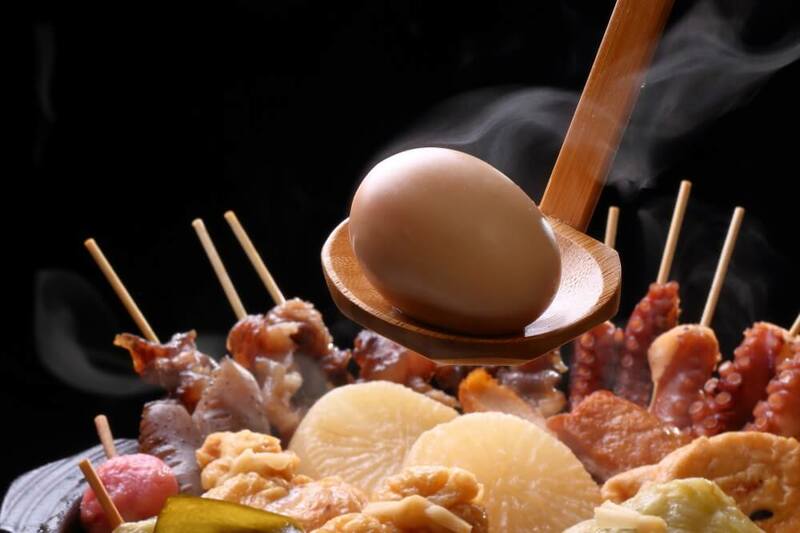 Oden is a standard of Japanese home-cooking that just cannot be missed. 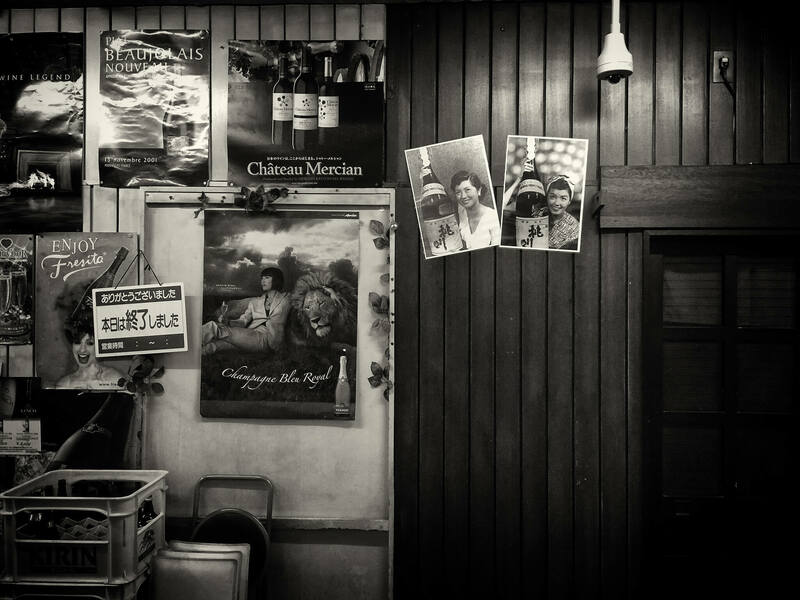 At this small eatery you can also get a feeling for decades of history in the Shinbashi neighborhood. Stop by and rub the belly of the local Mascot Tanuki (Japanese Raccoon) for good luck and find out why he is the patron saint of restaurants across Japan. 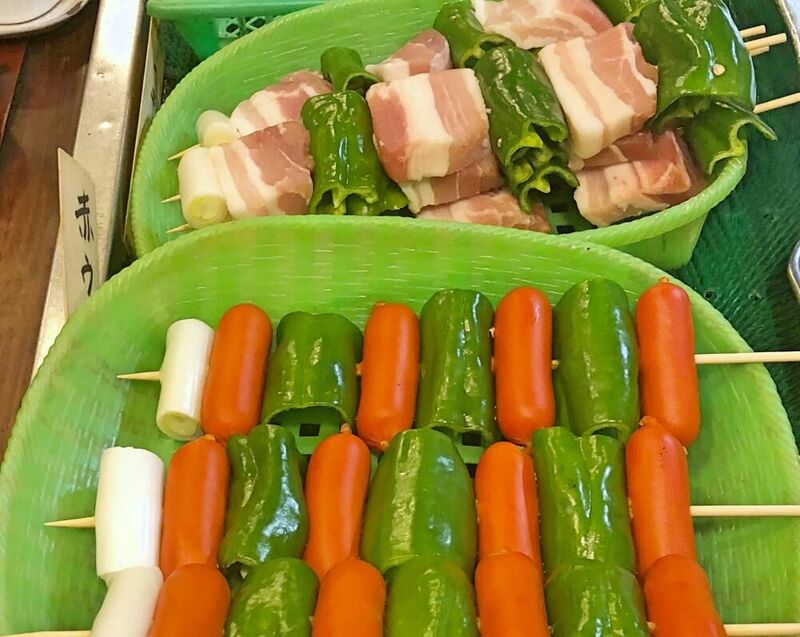 Next up, Skewers! 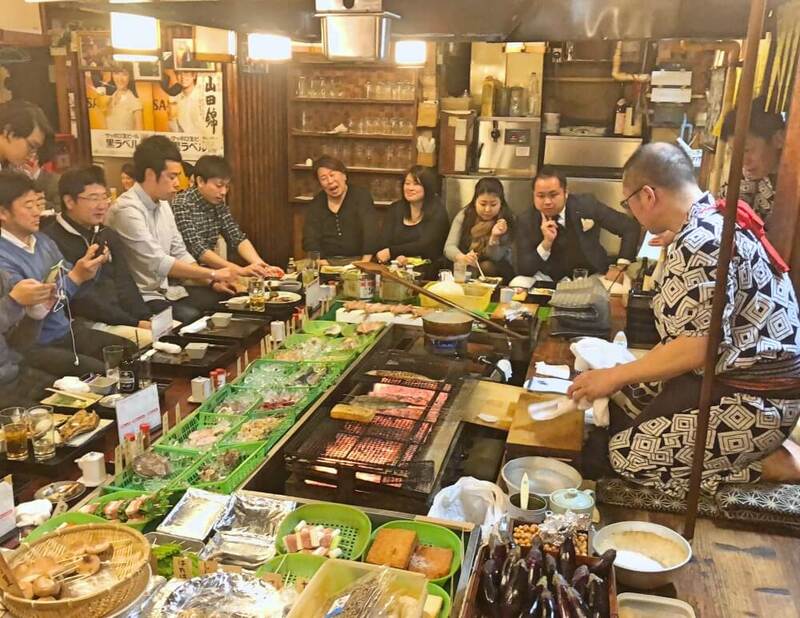 Yes, you will get to try Yakitori- world famous Japanese meat and veggie BBQ skewers grilled over charcoal in a classic, Shinbashi- Under the Tracks- restaurant. Feel the energy of the afterwork crowd as the busy trains pass by overhead. 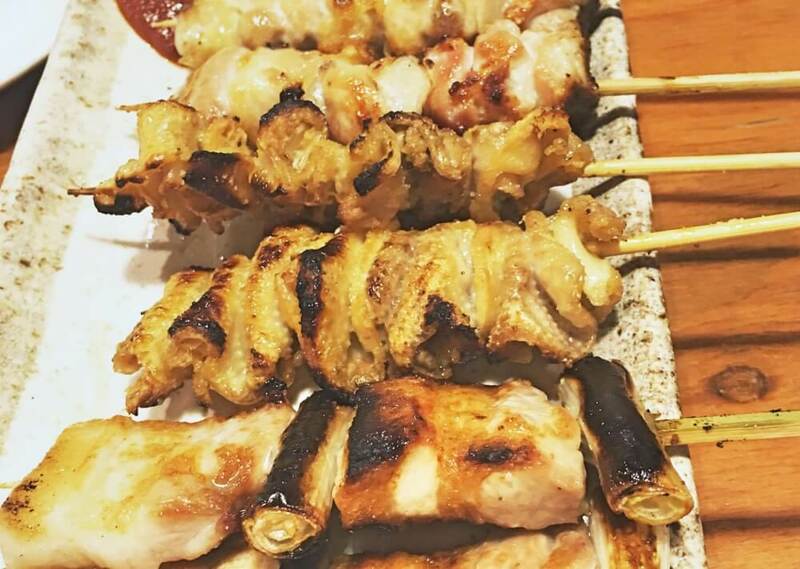 Unlike foreign barbecue, Yakitori is not marinated. It is seasoned once it is done coooking. 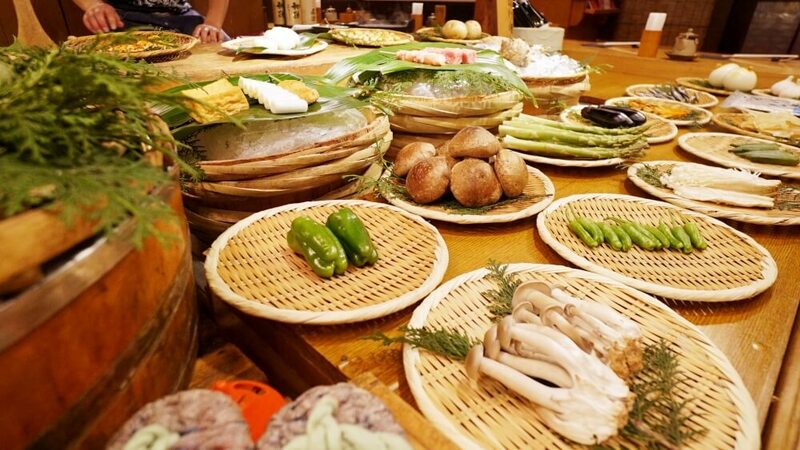 Street stalls and down-to-the-earth establishments will have their own specialities, either preparing it tare (sweet soy sauce) or shio (salted). 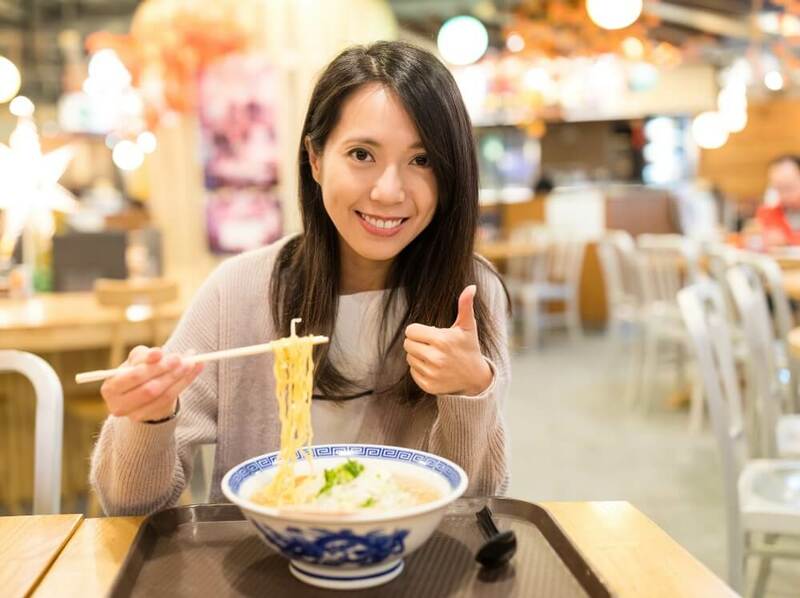 One of the most popular Japanese foods, second only to Sushi– Our next stop you will have a chance to indulge in a perfect, rich, savory, bowl of RAMEN! These noodles are an adaptation of Chinese soupy noodles in broth that first hit Japan in the late nineteenth century. 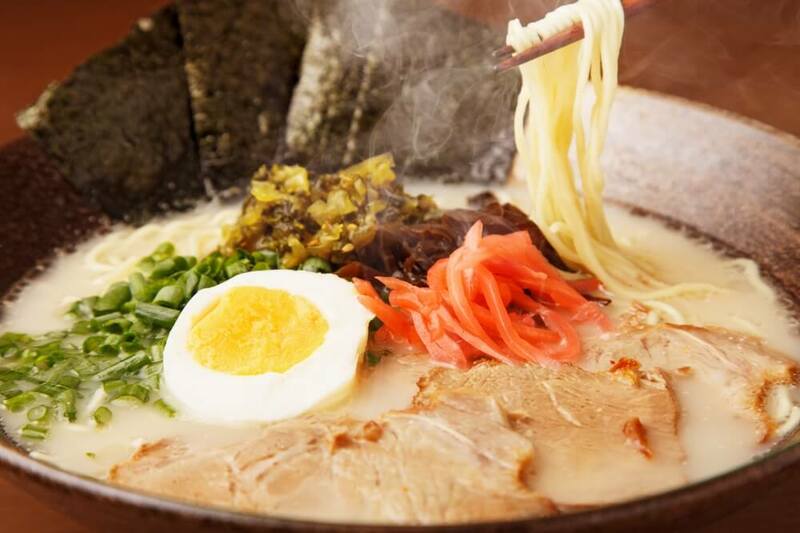 It wasn’t until the end of World War II that Ramen became cultishly beloved, when repatriated Japanese soldiers brought home with them a love for noodles they had tasted overseas. Many postwar families set up ramen businesses to support themselves, often cooking from pushcarts. 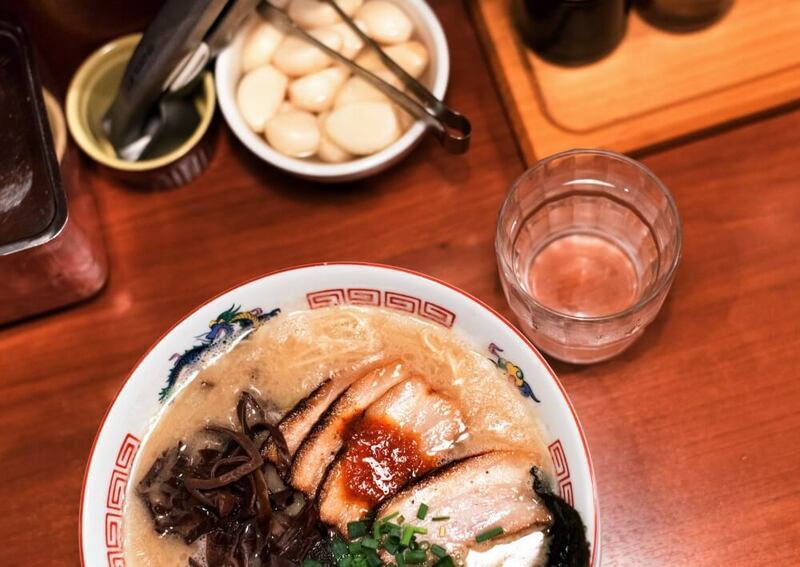 From there, ramen quickly evolved and acquired regional characteristics. We will show you how to order, what the basics are, and the most important thing, we will help you practice your essential SLURPING techniques! 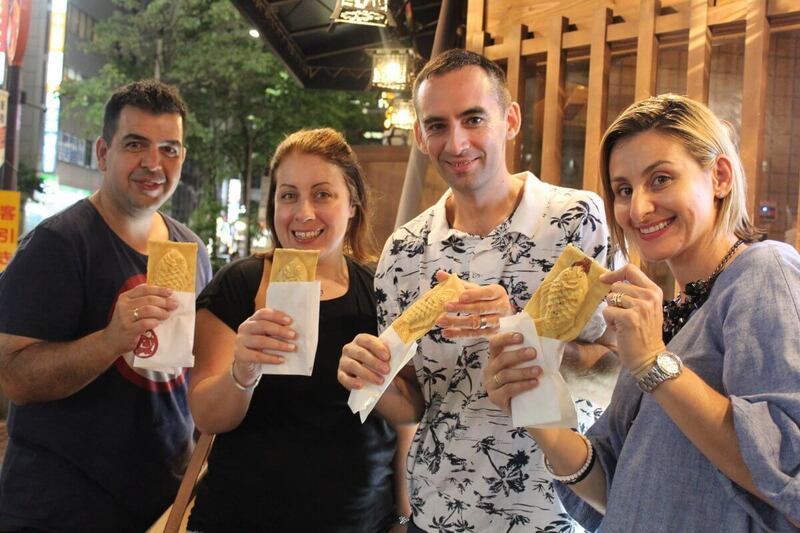 Finally we will try a special traditional Japanese dessert called Taiyaki, a fish shaped sweet food with choices of cream or azuki (bean paste) filling. You will have the opportunity to watch this being cooked in front of you. This is one of the best taiyaki places in Tokyo, this is an all-time favorite! You will definitely be full at the end of this eating adventure! Taking our time at the last spot and once everyone has had their fill we will end the tour back at Shimbashi station for everyone to head safely home. Visit 5 Food stops/ Including a dozen Local Dishes, Desserts and a Drink. 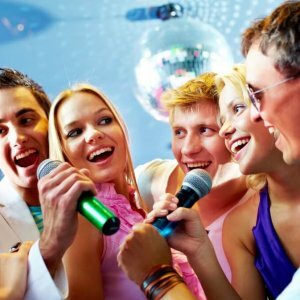 Have even more fun by adding a “Karaoke After Party” package to your food tour. Find out more here. Minimum of 2 people needed to book this tour. If you are a single traveler, please email us directly. Please let us know if you have any dietary restrictions or allergies. We have family friendly pricing on many of our tours, BUT This tour is for adults over 20. Thank you for your understanding. If you would like to book a tour with children please check our Family Friendly Page or inquiry to bookings@arigatojapan.co.jp for recommendations. We have a strict policy about starting our tours on time. This is to project the enjoyment of all our guests and restaurant partners. We are sorry to say that if you are not able to arrive at the meeting point by the departure time, the tour will start regardless and no refund will be provided. We are also unable to accommodate meeting up in any of the food stops once you’ve missed the start of the tour. 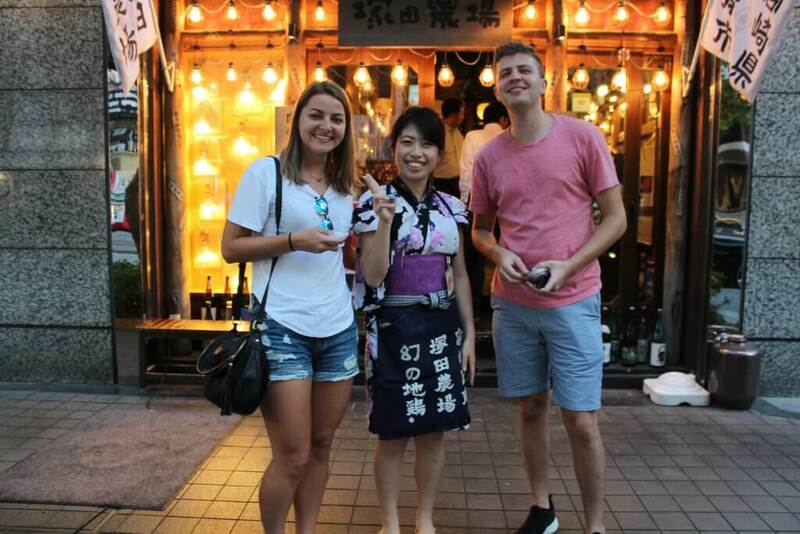 Arigato Tours are a great way to meet other travelers and food fans from around the world. However if you would prefer a private tour our rates are an additional fee of $75 per person. Larger groups please contact us by email to arrange. 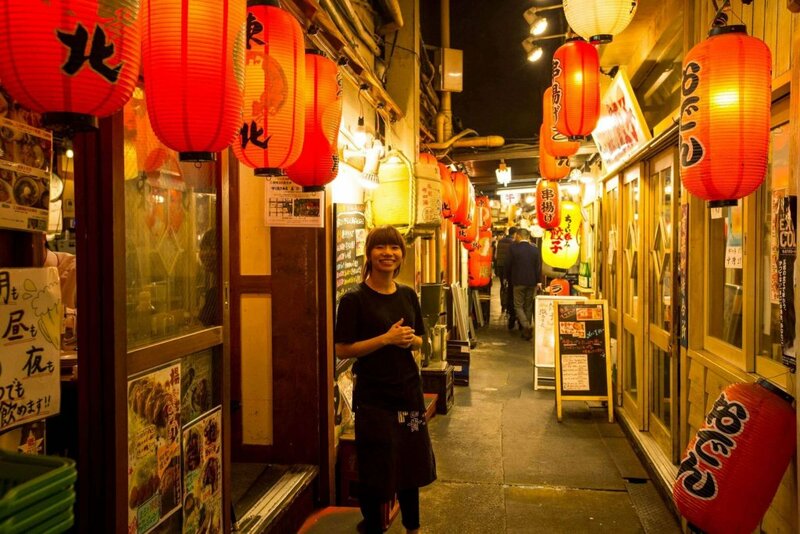 We spent the evening on the Shimbashi walking food tour with Anne the owner and it was fantastic. On our own we would not have found the restaurants that we visited and certainly would have ordered blindly. Anne not only explained the food to us but where in Japan it originated. Anne was absolutely delightful dedicated and knowledgeable. 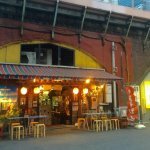 I would recommend this company to anyone visiting Tokyo as a first night thing to do. It definitely points you in the right direction for the rest of your stay. 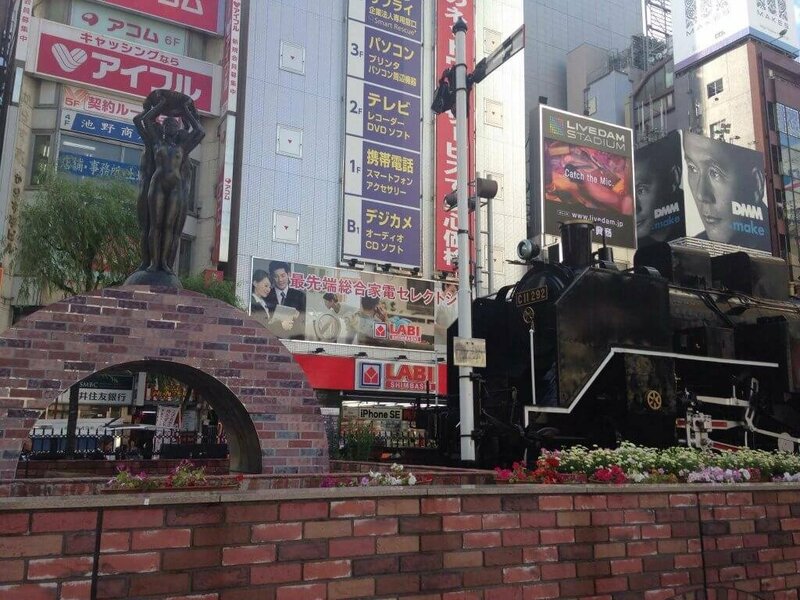 The area we meet is right in front of the decommissioned Steam Engine on the side with the statue of the three ladies. 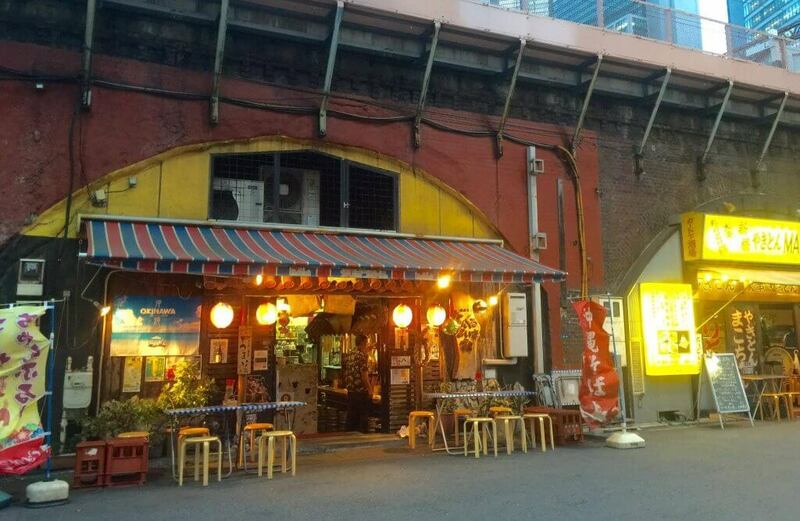 If you notice on the google map, this area is directly out of the Hibiya Exit from Shinbashi Station. 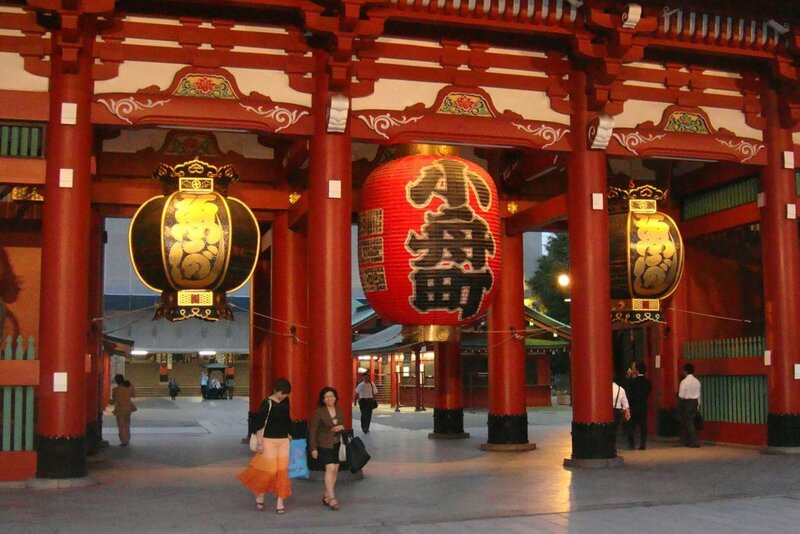 Our guide will be holding an Arigato Japan Sign. The tour involves walking so please wear comfortable shoes. On rainy days, we recommend bringing an umbrella. They can be easily purchased at any convenience store.